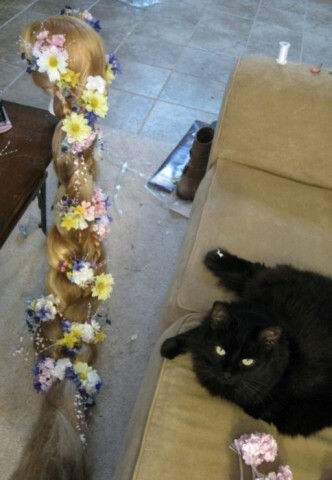 How to Make Rapunzel’s Giant Braid « Adafruit Industries – Makers, hackers, artists, designers and engineers! Some of the coolest hair in all of animation belongs to Tangled’s Rapunzel. It’s almost impossible to wear a wig as long as hers, but cosplayers can replicate her locks when it’s put into a braid. 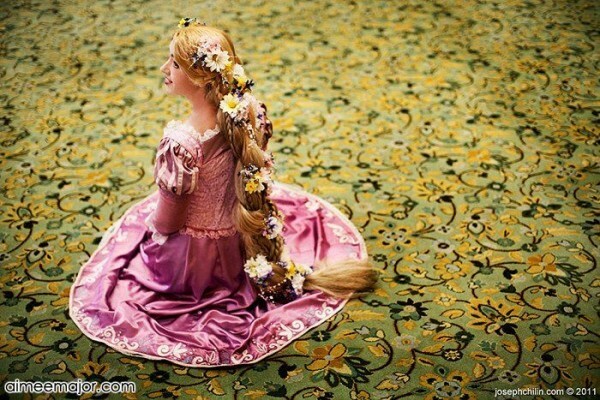 Instructables user aimeekitty worked on a Rapunzel costume last year and went for that look, and she said it was still a challenge to work with all the long hair. To make the large braid down the back, I was basically working the remaining hair from the base wig (still attached to the base wig) in with additional hair. The duplicate wig’s hair was cut off and added to the Black n Gold Braid extensions. I separated all this loose hair into three sections and secured each one with a tight hairband. (Or you could turn each section into a weft.) I then attached these three sections to the back-neck area of the base wig. Look for one of the lower wefts (the long horizontal bands where hair is attached) on the base wig so that you are sort of sandwiching the new hair inbetween the existing hair of the base wig to hide the attachment. You can handsew the three sections onto the base wig’s lower wefts. Use a really strong thread and knot repeatedly to make sure it’s secure. Then I worked the base wig hair into the three sections and braided them all. After that I made some smaller braids with excess base wig hair and inserted them where I thought they would be pretty. Read more about the costume at Instructables.